A colossal company that since 1665 celebrates the true and authentic wine, through the enhancement of the local grapes of the area, spearhead of the heel of the peninsula. To celebrate who in this wine first believed, Salvatore Leone De Castris, his son Piernicola thought that dedicating the selection "For Him" he would honor his father's memory. He created two labels, Primitivo and Negroamaro, which enrich an already incredibly complex and complete range, wines projected towards the future and of a gustatory design that is marked by the sea and the Salento sun. 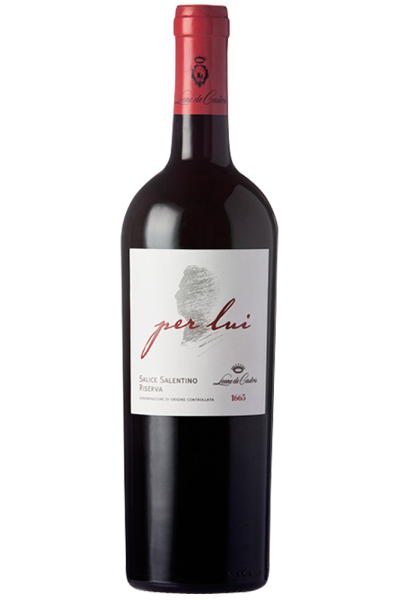 Ruby red color with garnet highlights, with a deep and mineral nose of flint, balsamic and menthol notes, hints of red fruit in jam and spicy sweet notes of cloves and cinnamon. The sip is dry, balanced and elegant, well balanced between freshness and flavor and soft in the glyceric note, in a long, very long finish with balsamic references. Perfect with important dishes of game, pappardelle with wild boar ragù, polenta with venison and with very aged cheeses.